Today, July 28th, from 6:00-7:00 pm PST, Teri Mills will join host Maribeth Healy, Executive Director of Oregonians for Health Security and Mara Kieval, Oregon Field Director of Healthcare United on KBOO 90.7 fm You can listen in live by visiting the KBOO website . Teri and Kindra Scanlon, who co-authored the Medscape article, Nurses and the Public Say It’s Time for Change will appear as guests on Thom Hartmann’s national radio show on Air America this WEDNESDAY, July 30th, 10:50 am PST. Please visit http://airamerica.com/stations to find your local radio station. We look forward to taking your questions. We have requested to archive links at here and will include those in an upcoming newsletter. I listened to the radio program tonight on KBOO. I wanted to give you kudos for a fabulous presentation, along with Mara from Healthcare United... We definitely need a healthcare system that works for everyone! The Office of the National Nurse will be pivotal in this much needed change by leading the disease prevention and health promotion efforts! Let's get down to the business of CARING FOR PEOPLE!! You are on the right track... :-) Kudos, and keep up the good work!! Thank you to those of you who have written to us and commented on the article in Medscape, Nurses and The Public Say It's Time for Change. The National Nursing Network Board of Directors wants to address some misconceptions and fears expressed by readers. We do not need this position because it already exists. This position/role is not well understood by nurses or the public. The title itself would indicate a position of stature and widespread recognition, yet few can name the Chief Nurse Officer of USPHS or describe the role and responsibilities. Congressional action is needed to formally bestow the title of National Nurse on the CNO to provide the status, authority and public recognition to lead mass scale prevention efforts and shift to a culture of prevention in US healthcare. The position needs to become full, rather than half time, and focused on leading prevention efforts by encouraging all nurses and future nurses to spread prevention messages in their communities. The ONN would duplicate services. This single position would focus on organizing and enhancing existing services to focus on prevention. The Office of the National Nurse would create a new office/new bureaucracy. The National Nurse is an existing position, that of the CNO of the USPHS. This position would continue, and the current responsibilities of that position would continue. But, the CNO position would elevated and expanded to full time and housed in the Office of the Surgeon General. The primary purpose of this new CNO role would be to focus and provide symbolic leadership for a cultural and philosophical shift to prevention that would occur at the local level. Nurses in every community would be encouraged to follow the leadership of the National Nurse and become locally involved as their time and energy allows in MRCs and other prevention networks. There would be another position of ONN above the CNO, thus demoting the CNO of the USPHS. The CNO of the USPHS is the National Nurse. The positions are one and the same. This initiative would simply elevate that position to deserved prominence, stature and authority, thus enabling the NN to effectively lead prevention efforts. Funding a National Nurse would deplete scarce funds available for other needs of nursing. Increasing the existing CNO position from half time to full time is not a significant cost, especially considering the potential return on investment via cost savings through national prevention efforts. The CNO position is funded, but we are asking for a higher pay rank (the ANA, COA, and Quad Council are in agreement and are also recommending this to happen). The ONN initiative recommends utilizing existing resources to lead and support volunteer efforts that will build MRC and other existing prevention networks, including the work of the nation's parish nurses. It does not compete for funding earmarked for nursing education or research. The NN would drain money from existing programs. The ROI for prevention efforts is potentially high. The immediate costs of promoting prevention via a NN would be minimal because the concept is based on expanding existing networks, such as the Medical Reserve Corps that are already funded and functioning. Many prevention programs are already funded and would be enhanced when nurses serve as volunteer "messengers" of their programmatic materials. If you have other questions, please email Teri . Yesterday the Trust for America's Health released their report Prevention for a Healthier America: Investments in Disease Prevention Yield Significant Savings, Stronger Communities. They found an investment of $10 per person per year (that would be 2.7 or 3 cents a day) in proven community-based programs that included ways to increase physical activity, improve nutrition, prevent smoking, and stop use of other products containing tobacco could save the United States more than $16 billion each year within the next five years. The ROI (return on investment) would be $5.60 for every dollar spent. The study included many examples of community-based prevention programs that significantly improved the health of participants. One point the researchers included was that we need more research into community-based disease prevention programs, what works and what doesn't and how to best target communities, because these programs have great potential for reducing unnecessary and painful conditions as well as saving costs. Nurses and Americans are calling for pragmatic and cost-effective solutions. Visit our Home Page to read the Office of the National Nurse proposal. What is being suggested is quite simple, encourage participation of students, nurses and retirees within programs that already exist in communities that engage in prevention activities that have proven successful, coordinating these efforts through the proposed Office of the National Nurse. We agree with Trust for America's Health report. There are numerous prevention models and programs around the country that are demonstrating positive results, but these need to be replicated and expanded throughout the country. Nurses as the largest and most trusted health care workforce are well positioned to take the lead to make this happen. Be sure to read our recent publication on Medscape's Ejournal for Advanced Practice Nurses: Nurses and the Public Say It's Time for Change. If you need help in obtaining this on line, please email Teri . We need your help to make the Office of the National Nurse a reality. 1. Contact Teri for a free poster and also to sign up for email newsletter updates that can also be forwarded to your family, friends, and peers or posted on websites. 2. Ask organizations you are a member of to endorse the Office of the National Nurse initiative. 4. 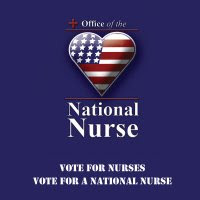 Write a letter of support to the Presidential candidate you are supporting and urge him to put language about the Office of the National Nurse proposal into his platform statement on nursing/healthcare. 6. Make a donation to the National Nursing Network Organization. We are a non-profit organization, but are not tax exempt; therefore contributions are not tax deductible. Yes definetly,you can do better ,Why do you have to be in doubts.You will make others satisfy.But mainly you should be sure there spendings for your medical problems so you can solve them.Do not depend always from the mental health.You should be steady for everything. Visit the Leominster Champion newspaper to read an uplifting story about the graduation ceremony of Mt Wachusett’s Nursing Class of 2008. Representative Christine Canavan was the keynote speaker and she praised the students for inspiring the Massachusetts Legislature to pass a joint resolution encouraging Congress to create an Office of the National Nurse. Representative Canavan, also a nurse, was the original sponsor of this piece of legislation. "These students, these nurses, were learning to use their voice in politics," Canavan said. "They were learning how to make others listen to them when it came to their field of expertise. I hope that all of you take that lesson with you as you move forward in the field of nursing. You must be active. You must use your voice. You must share your knowledge. Realize and be proud of the fact that you are now considered an authority." Massachusetts is among one of three states who have now passed resolutions urging the United States Congress to enact legislation to create an Office of the National Nurse. It is not too early to write your own state legislators and encourage them to sponsor similar legislation. Please email Teri for more information. 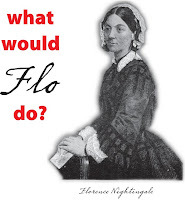 Serve as a prominent nurse icon for prevention. Strengthen preparedness and prevention within the MRC units. Guide nurses to promote prevention in their local communities. Generate interest in nursing careers and other health professions. Strengthen partnerships among existing national, state, and local public health services. 1. Visit http://nationalnurse.org/takeAction.shtml for links on ways to contact your Representatives or Senators. 2. Contact Teri for a free poster and also to sign up for email newsletter updates that can also be forwarded to your family, friends, and peers or posted on websites. 3. Ask organizations you are a member of to endorse the Office of the National Nurse initiative. 5. 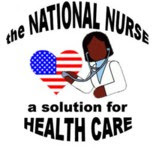 Write a letter of support to the Presidential candidate you are supporting and urge him to put language about the Office of the National Nurse proposal into his platform statement on nursing/healthcare. 7. Make a donation to the National Nursing Network Organization. We are a non-profit organization, but are not tax exempt; therefore contributions are not tax deductible.